Welcome to the Muffin the Mule Collectors' Club website! 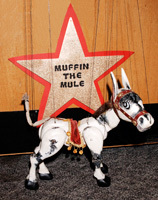 When the Muffin the Mule Collectors' Club was set up in 1999, it was, primarily, for collectors of 'Muffinabelia', that is, items produced in the 1950's associated with Muffin and his friends. Since that time the club has grown to include other members whose interest is puppetry or nostalgia TV in general. We hope that, whatever your interest, you enjoy your visit to the new look site and....join the Club. Because of the great interest in Muffin, there was considerable range of goods marketed at the time. Muffin appeared weekly in the TV Comic and the original Muffin Club was promoted with articles and information about club members and their activities. The money raised through subscription and fundraising undertaken by individual children, was used to buy televisions and radios for hospitals - for sick and deprived children. 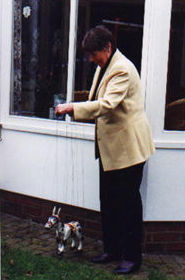 Muffin and his friends were Hogarth puppets and we have been fortunate to have the support of Sally McNally, who owns Muffin. Sally is the daughter of Ann Hogarth and Jan Bussell (who were The Hogarth Puppet Theatre), herself a talented puppet manipulator and actress. 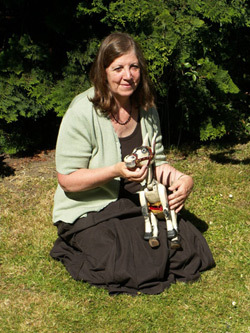 The importance of the Hogarth Puppets in the history of British Puppetry and television make the written contributions from Sally a very important part of the club newsletters. Adrienne Hasler is available for talks to groups in the Essex /North East London area. Fees are donated to the club charity - Friends of Lyndon House (see charity information for full details). Please email through the website to book a talk. SPECIAL Book Price �12 includes postage & packaging. Click here for more details. 60 years ago today, a small wooden mule took his first steps assisted by his manipulator, Ann Hogarth, onto the top of a grand piano. Given the name of 'Muffin' by his human companion, Annette Mills, Muffin the Mule went on to become an international star of stage and screen. 60 years on, he is once again entertaining both adults and children both in his original form as a marionette (stringed puppet) but also as an animated star of CBeebies. Now accompanied by Ronnie Le Drew (whose credits include his well known role as Rainbow's Zippy), Muffin is heading back to the stage as guest star in a panto this Christmas. Maybe not the best day to have chosen for the annual club meeting which brings together Muffin the Mule and members of the Collectors' Club. However, a bright blue sky, high temperatures and the promise of full television access to England's first game in the World Cup ensured a good turn out. This afternoon held even more memories than ever and was a prelude to celebrations for Muffin's 60th anniversary later this year. A mix of well established members and new members attended the event to meet, for the first time, Muffin's new manipulator, Ronnie Le Drew. It was with some trepidation that the afternoon was organized as it would be difficult for those of us who knew Sally to see Muffin in someone else's capable hands. Ronnie was magnificent. Not only is he a wonderful puppeteer but he bridged the gap between The Bussell family (Hogarth Puppet Theatre), of which Sally was a member, by describing his own youthful employment with Sally's parents. The day was further enhanced by the attendance of Jane Eve (nee Tyson) and Jane Phillips. For those in the know, both 'the Janes' are also brilliant professional puppeteers. Talk about an abundance of talent! By coincidence, not only did we have three professional puppeteers but we had three professional (Hogarth) puppets. 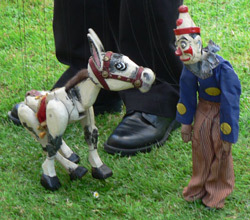 For the first time in decades, Muffin was reunited with Crumpet the Clown whose appearance on For the Children in 1946 was brief, unlike the Mule. Not to be ignored, Katie the Kangeroo also met Muffin. Katie being one of 'Muffin's friends' makes an appearance in many of the story books. She had been gifted to Pauline Jackson who worked with Ann Hogarth on the Muffin shows and on tour as puppeteer. Katie has now become a fixture in the club. All in all, a wonderful, busy, tiring day. A parting question...will there be another next year? A question to ponder as I lay in a darkened room....hoping that the washing up would mysteriously disappear. If you would like to meet Muffin, join the club and help us raise more money for our charities. Muffin the Mule started his life known merely as the Kicking Mule. He was carved by Punch and Judy expert carver Fred Tickner. 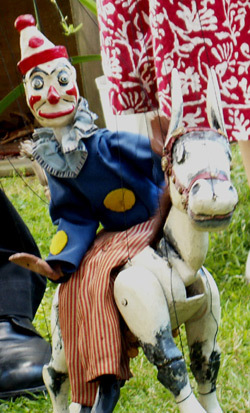 Fred Tickner maintained his reputation as a highly respected puppet carver throughout his life and his Punch and Judy puppets are still highly desirable and used by professional puppeteers. 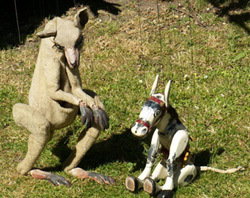 The Kicking Mule was created as a commission for Jan Bussell and his wife, and business partner, Ann Hogarth. The Bussells having formed the Hogarth Puppet Theatre in 1932 and the Kicking Mule was to partner Crumpet the Clown as part of their Circus. The Kicking Mule was created in 1933 but it was not until some thirteen years later that Muffin came into being. 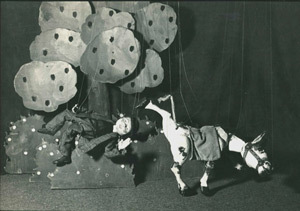 Puppet Theatre was (and remains) a highly professional and busy form of performance and the Bussells were constantly expanding and improving the acts they created. After a while, the Mule and Clown were retired to make way for other acts. The aggressive little Mule sat with the other retired puppets until one day a visit from Annette Mills changed the lives of all concerned. 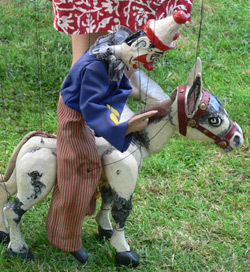 Selecting puppets to use in her BBC programme For the Children, Annette chose the mule and clown. She named the mule Muffin and the rest, as they say, is history. 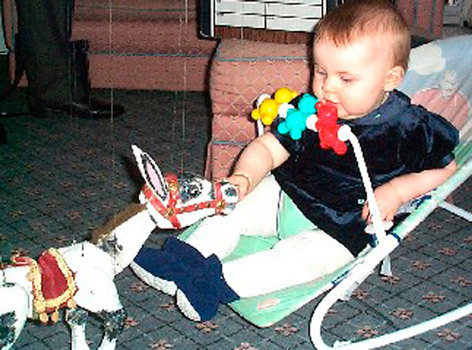 To read more about the Hogarth Puppets and Muffin and the merchandising that was created click here for information on Muffin the Mule - Commemorating 60 years of Muffin the Mule with Memories and memorabilia. The Collectors' Club will celebrate the 60th anniversary of Muffin's BBC television appearance with an afternoon allowing members to meet Muffin and friends. To be held in June. Details to be announced in the February newsletter. If you would like to meet Muffin please contact the club for a membership form. Family and friends welcome. Photographs Courtesy of the BBC September 2005. Please note that all of these images are copyright of the BBC. Muffin returns to the BBC some 58 years eleven months and twenty days after his first appearance (20th October 1946). His new timetable can be found on the BBC's CBeebies pages. Muffin has returned minus his strings but retaining all of the charm and personality that made him the first international television star. Of course, he was already a widely travelled puppet being part of the highly respected Hogarth Puppets troupe which toured the world. 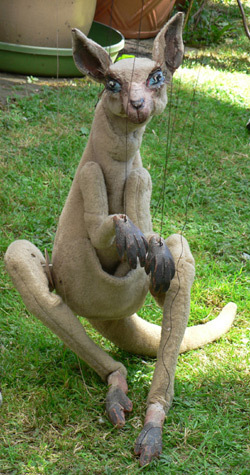 Muffin's television fame brought him to the forefront of the puppet theatre. The new animated series draws on the original personalities of Muffin and his friends but brings the world in which they live up to date. Having been allowed to have a sneak preview of the programmes, I have little doubt that 'new' Muffin will be as popular with todays children as he was with my generation of children. If you would like to read more about vintage Muffin and how the new series developed, please click here and you will find details of the definitive guide to Muffin the Mule. As the Collectors' Club celebrates its 6th birthday, Club members are looking forward to seeing the new animated version of Muffin the Mule scheduled to be shown on the BBC's 'CBeebies' in September. 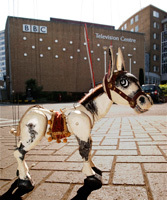 The series is to be accompanied by the publication of a 60th anniversary annual and four new stories featuring the 'new' image Muffin the Mule and, an anniversary DVD is also planned. In addition, also available - 'memories and memorabilia guide' book written by Adrienne Hasler which covers the both the history of the original Muffin the Mule (and the humans involved with him) and contains the first ever collectables guide listing original merchandising. The club continues to support the designated charities through donations from subscription and other fund raising activities at our annual Club afternoon. This year the meeting will be on 8th October and, as usual, will feature the original Muffin the Mule and many of his friends. Muffin meeting a young admirer. Courtesy of Mrs V Neville. Sadly, Sally McNally died from cancer in May 2004. She leaves behind her, her family - her husband, Derek, daughter, Lucinda and son, William & their respective families. Derek has been involved in Sally's work with Muffin for many years and has generously agreed to carry on with recollections of his own for the newsletter. Sally saw the first of the new animated stories and had the knowledge of all that is to come as the BBC and Muffin work towards celebrating 60 years of children's television. Muffin himself (& his friends) will continue to delight children (young & old) at our Club days�.the next will be a celebration of those first 60 years. Since its beginning, the Collectors' Club has attracted not only the collectors who can take advantage of having a book and toy dealer as members but, also, those people with an interest in the actual Muffin the Mule programmes and related 1950's children's television programmes. Muffin and his friends are now set to return to the BBC sixty years after Muffin's first appearance. In the spring of 2003, Maverick Entertainment Plc, a company that specialises in the creation, acquisition and development of Intellectual Property Rights in children's television programmes, characters and related products, signed a deal with Sally McNally which will allow them to bring Muffin back to our screens in 2005/6. Although Muffin will be animated, and not be seen on a piano top, it is not the first time that he has appeared in this way. 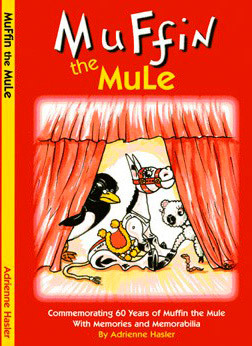 In the late 1950's, Jan Bussell and Ann Hogarth produced an animated story featuring Muffin. Club members who attend the annual Club Day have been privileged to be shown this delightful little film. Muffin loses none of his charm by being seen in animated form and I believe that a new generation of Muffin fans will to be found viewing the programmes. In the mean time, the DVD and video of eight original episodes can be purchased from the usual high street and on line retailers. I am Adrienne Hasler, who, when not hunting for Muffinabelia, looks after a grown up family. My nursing background did not prepare me for the computer skills required to set up this site so I would like to thank my eldest son and his girlfriend for their support and work in setting up and revising the site. I set the club up in the summer of 1999 because, during the course of my own Muffin collecting, I found myself appearing on the C4 programme "Collectors Lot". I discovered other collectors were having the same problems as myself - of finding sources of Muffin items. I have now established several contacts and indeed, two of my first members were the toy dealer who has been very helpful finding items for me and also the book dealer who has been my source of several books. Both work hard in their efforts to find items for Club members. As with the original Club, we are non-profit making and are supporting two charities from the subscription fees - one, "Friends of Lyndon House" - a respite home for children with special needs and the other, "Freshfields" is a rescue centre for donkeys with a unique facility to help children with special needs. Click here to read more about them. When the original Muffin the Mule Club was in existence in the 1950s, the club donated money to buy televisions and radios for childrens hospitals. Carrying on this tradition, the Collectors Club is nonprofit making and thus far, since the club started in 1999, we have raised over �6,000 for our chosen charities. Freshfields is a unique charity in that it has a dual purpose. It is responsible for rescuing donkeys from inappropriate situations and caring for them in a very special way. The donkeys are cared for by children, who, themselves, have special needs. The children are allocated their own donkey for the duration of their stay and under supervision, the child cares for their donkey. Freshfields is the home of The Michael Elliott Trust (a registered charity) and is situated near Buxton in the heart of the beautiful Peak District National Park in Derbyshire. Lyndon House offers short stay care services for children with learning disabilities and a healthcare need. The unit is part of the Solihull Healthcare NHS Trust but, as with many other units, relies on fundraising to help supplement the basic equipment required by such a unit. The unit is staffed by specialist registered nurses and dedicated care staff, many of whom support the fund raising efforts of the Friends of Lyndon House. If you have any Playstation games or other games or toys that you feel might be of use to the unit or, if you would like to have more information, please write to or email the club.